From a National Jewish Book Award–winning author: The “revelatory and shocking” investigation into the CIA’s liberation of Nazi war criminals (Kirkus Reviews). How did Gen, Karl Wolff, one of the highest-ranking members of the Nazi Party’s Waffen-SS, who personally oversaw the deportation of three hundred thousand Jews to the Treblinka extermination camps, escape prosecution at the Nuremberg trials? As revealed in this groundbreaking investigation—culled from recently uncovered archival documents—the answer lies within the US government, which buried reports on the Final Solution and was complicit in the recruitment of Nazi war criminals, all to protect the world economy. Among the key players was CIA director Allen Dulles, who was not only instrumental in Wolff’s exoneration but also responsible for installing former slave-labor specialists into positions of power in postwar Germany. 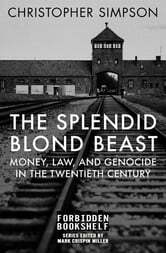 In this damning exposé of American government malfeasance, author Christopher Simpson traces the roots of mass murder as an instrument of financial gain and state power, from the Armenian genocide during World War I to Hitler’s Holocaust through the practice of genocide today. 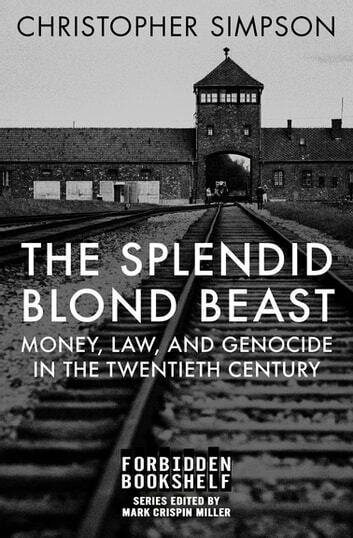 Detailing how the existing structures of international law and commerce have encouraged mass killings, corporate looting, and profiteering at the expense of innocent victims, The Splendid Blond Beast is a disturbing and profound book about the success of evil in our time. The award-winning author of Blowback and Science of Coercion, Simpson also served as research director for Marcel Ophüls’s Oscar-winning documentary, Hôtel Terminus: The Life and Times of Klaus Barbie.